The addition of a pool can improve the value of your Clearwater home greatly. However, a poorly maintained one will possibly be worse than none at all, so you will most likely find yourself looking for the best pool cleaning service in the area. In the end, it is always up to you to hire a professional maintenance and cleaning team or perform the work yourself. There are, however, many reasons why you should let professionals take care of your backyard oasis. When you are ready to hire professionals to handle all of your cleaning needs, there are a lot of things to keep in mind. Finding the best pool cleaning service is not an easy task. You can probably start off by asking friends if they have any recommendations or advice. Triangle offers customized maintenance and repair services (like skimming, vacuuming, retiling, and more) to fit your needs in Clearwater. To make your life easier, here is a list of things to consider when you are looking for the right business to take care of your swimming area. Any professional services you consider should always be performed by a licensed company that also has insurance coverage. Should something go wrong with the maintenance, you want to ensure there will be somebody on the company’s side to settle the problem. The best pool cleaning service can manage every aspect of your waters. In addition to cleaning, we will also take good care of any maintenance work and repairs you will need over time. One company for all three services you need is two fewer phone numbers you need to save in your contacts. Plus, you will save money and time. Letting somebody into your backyard may cause some Clearwater homeowners slight discomfort, which is completely understandable. That is why Triangle will assign one certified technician to your account, so you know who is going to come to your home every time. Should any scheduling issues arise, we will let you know if we need to make any changes or if a substitute will be tending to your waters. We can’t forget to discuss the cost of having a professional take care of your swimming area. Triangle offers the best pool cleaning service with flat rate pricing. We will perform work on the schedule you want. Every day or once a week, maintenance will always be performed to the highest quality of standards and will keep your water clean and safe at an affordable price. The best pool cleaning service technicians at Triangle have helped Clearwater, St. Petersburg, Palm Harbor, Largo, and Seminole homeowners since 1959. We regularly upgrade our cleaning and maintenance techniques when something bigger and better hits the industry. We stay aware of the latest trends and innovations, so you will receive the best service possible. How Else Can Pool Cleaning Services Help? If you are the owner of a commercial pool, keep reading. Our trained technicians will take excellent care of high-volume and heavy foot traffic swimming spaces as well. We offer water monitoring twenty-four hours a day and provide automatic chemical adjustments for a worry-free management experience. Both commercial and residential pool owners in Clearwater will no longer need to worry about purchasing their own materials; Triangle gives you the opportunity to buy the products you need directly through our trusted retail provider. Where Can You Find the Best Pool Cleaning Service? 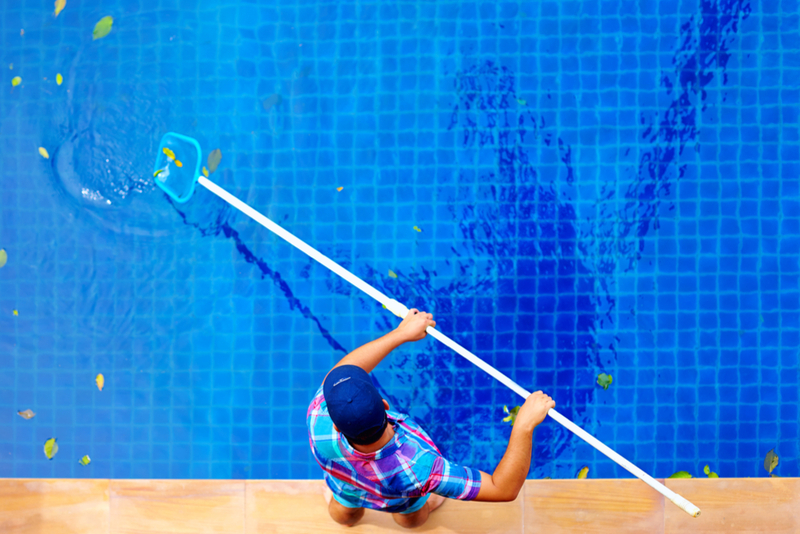 While there are many companies around Tampa Bay that clean pools, finding the best pool cleaning service for your needs at the right price can be tough. This is why Triangle takes care of your waters no matter where you are located in the Bay area. Our technicians will travel to your location in Clearwater, St. Pete, Palm Harbor, Largo, or Seminole. If you have any question concerning our maintenance and more, give us a call at (727) 531-0473 or contact us online.